ZAO Organic Cleansing Micellar Water cleanses, purifies and gently cleanses the face, while soothing the tightness and redness of sensitive skin. Its formula based on organic lemon balm hydrolat, witch hazel hydrolat and babassu oil has purifying, soothing and toning effects. Zao Vegan Facial Micellar Water gently removes make-up to leave your skin clean! 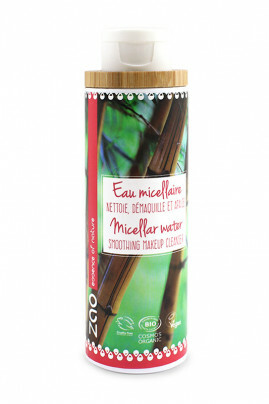 ZAO Organic & Vegan Micellar Water for Face is perfect for removing make-up! Soak a cotton pad or wipe with micellar water and rub over the entire face and neck. Repeat application until cotton is clean.